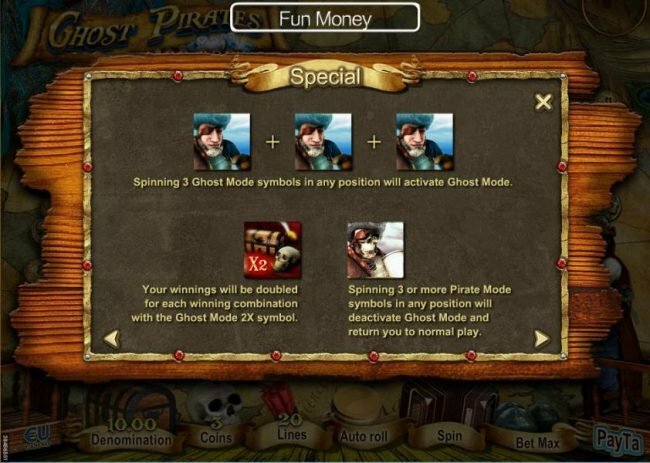 Ghost Pirates online slot machine pictures and slot feature list from Skill On Net, play Ghost Pirates Slots for free. 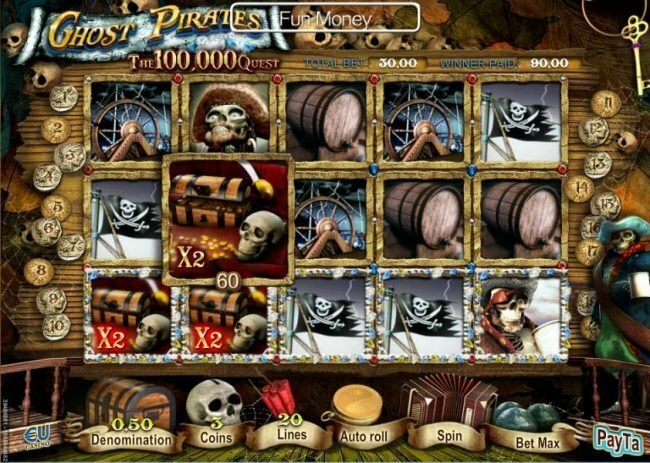 Ghost Pirates Slots has not been reviewed yet, be the first to rate this slot. 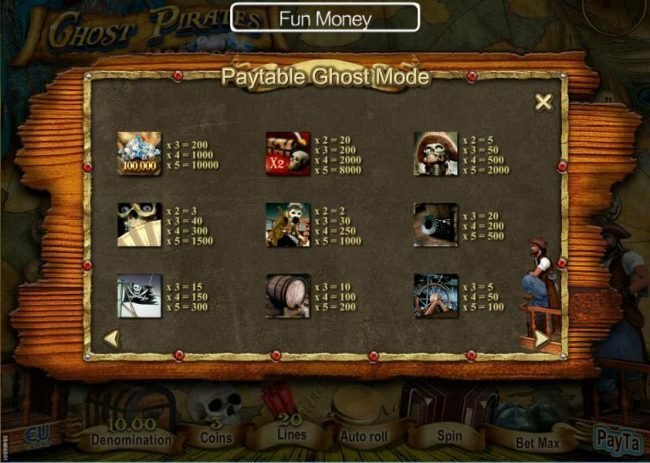 Ghost Pirates is a 5 reel game designed by SkillOnNet, which has 20 paylines. 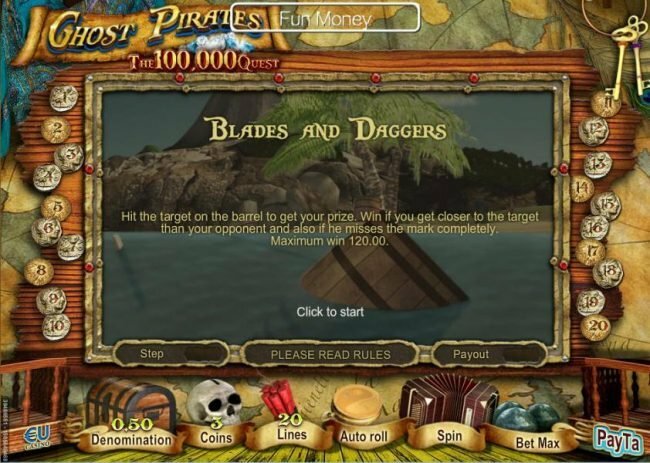 In this game you will find wilds, scatters and free spins. 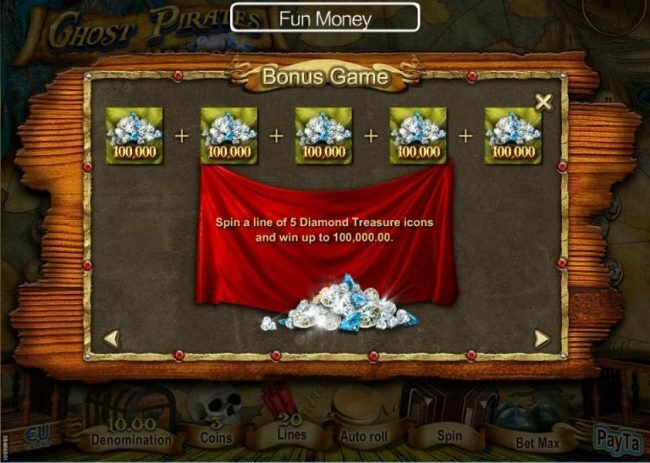 As for the top jackpot, you have a chance to win up to $100,000. 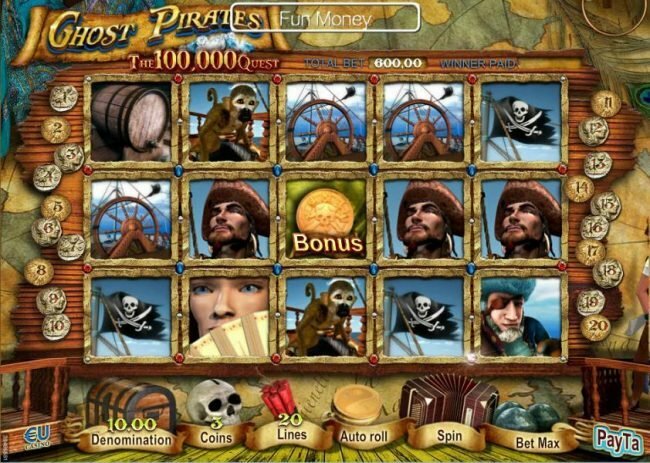 The theme of the game is easy enough to figure out, as the focus is on pirates just like the name suggests. The ghost part of the name is a bit harder to spot since there are no symbols with anything like that on the reels. 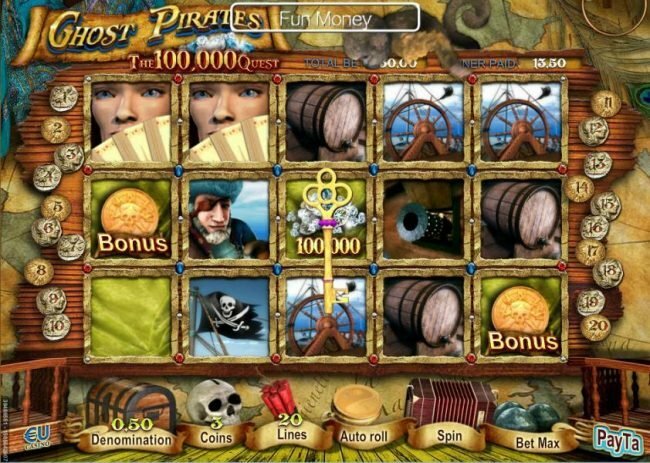 The game is one of the better designs that came out of this developer and it’s actually described as a 3D slot by them. 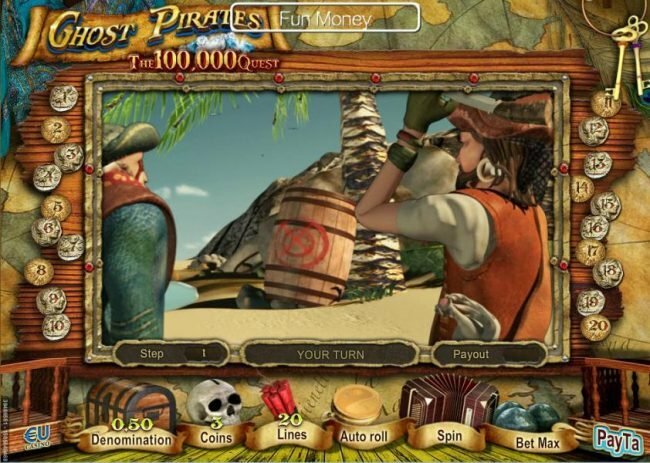 In the background image you will notice a mix of images, including a map and a pirate sitting on the right side. 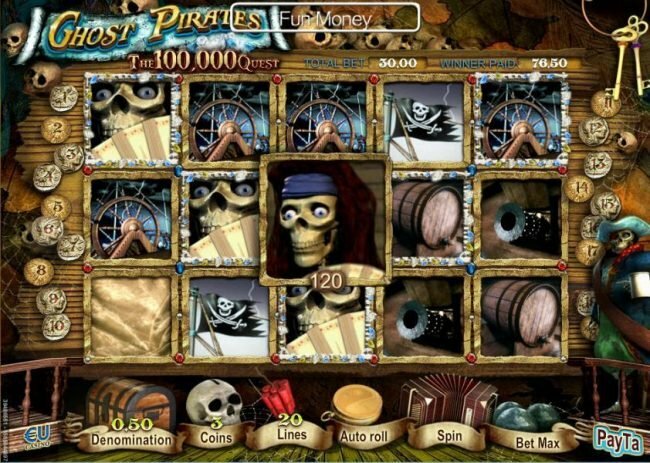 The betting options have various images to support them, including a treasure chest, a skull, dynamite and an accordion. 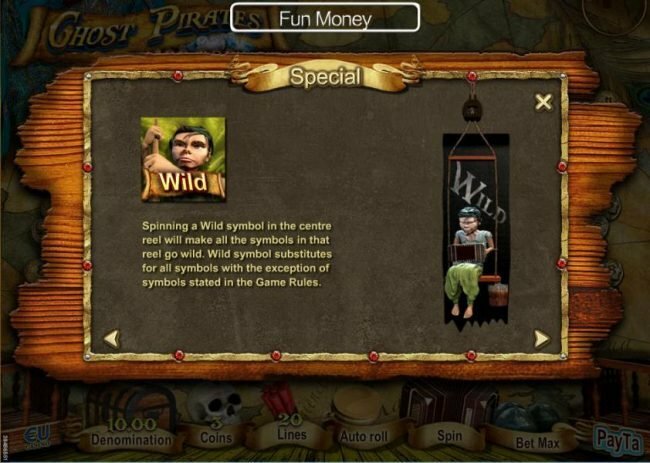 The symbols are just as well designed as the rest of the game and they include images with diamonds, treasure chests, pirates, monkeys, cannons, pirate flags, barrels, the sheep’s wheel and the gold coin. 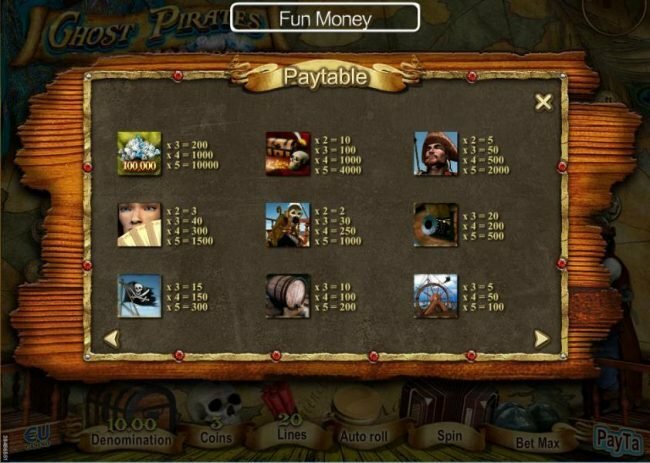 One of the things you will notice about this game is the impressive betting range that players can work with. It starts at $0.25 (one coin used to select just one of the 20 paylines) and it can go up to $600. 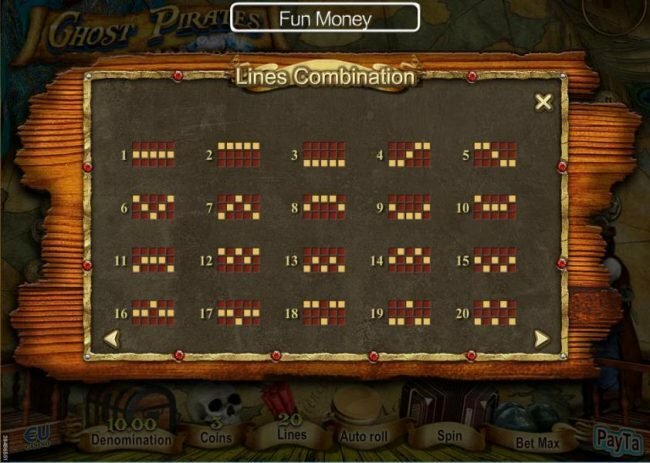 The maximum bet will use the maximum coin value of $10, with 3 coins per line which means a $30 stake. 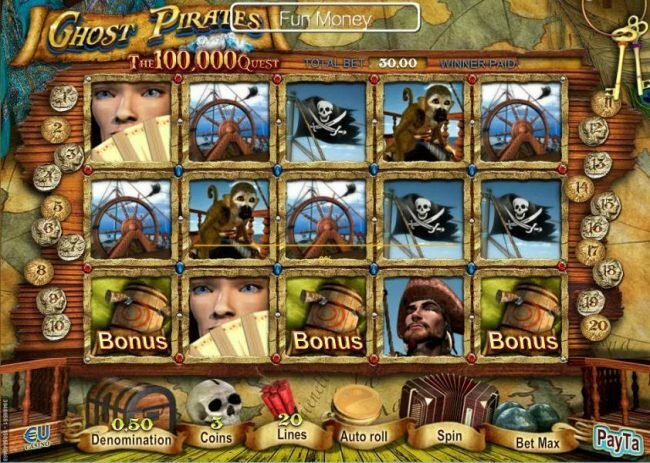 It can mean a decent jackpot for the player, which can win up to $100,000 by playing this Slot with a maximum line bet. 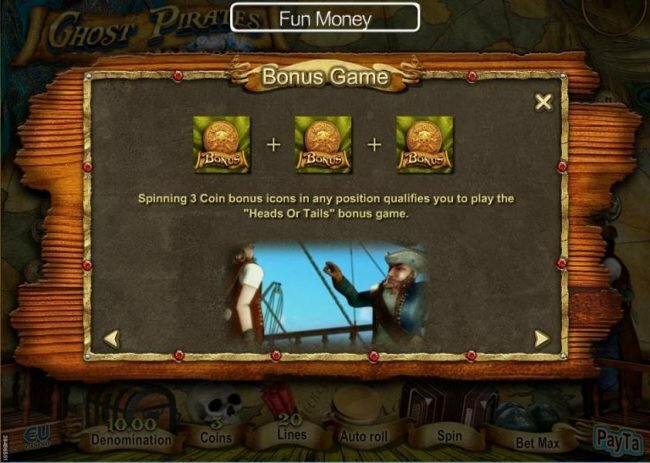 The bonus game is started once the player gets three coins as scatters in any position. The round that starts is called Heads or Tails. 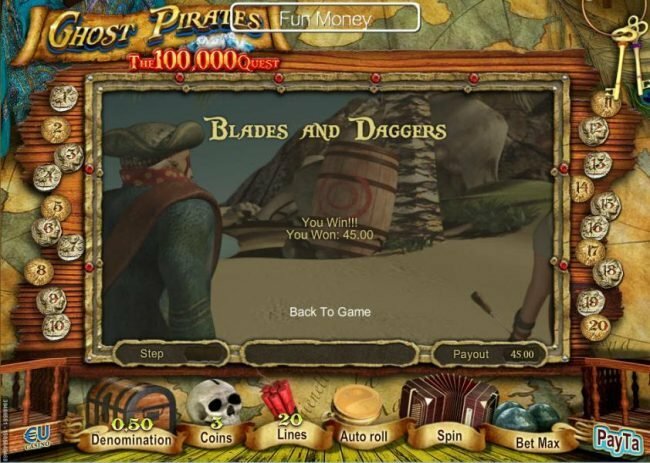 Another bonus game offered here is called Blades and Daggers, which requires three symbols with target practice images on them, once again as scatter symbols so it doesn’t matter where they show up. 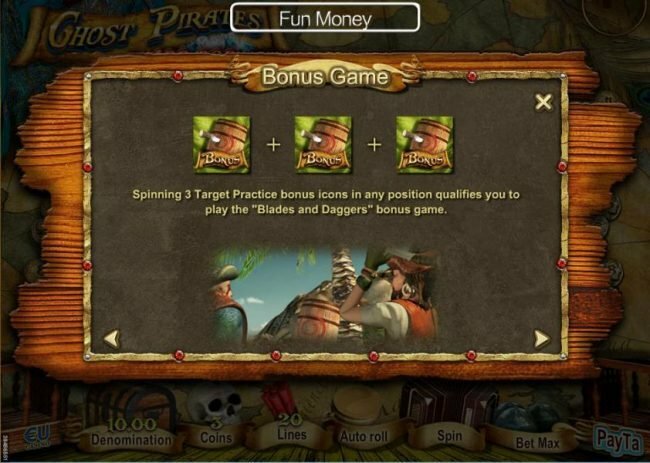 Finally, we have the third bonus round, called Lucky Door. 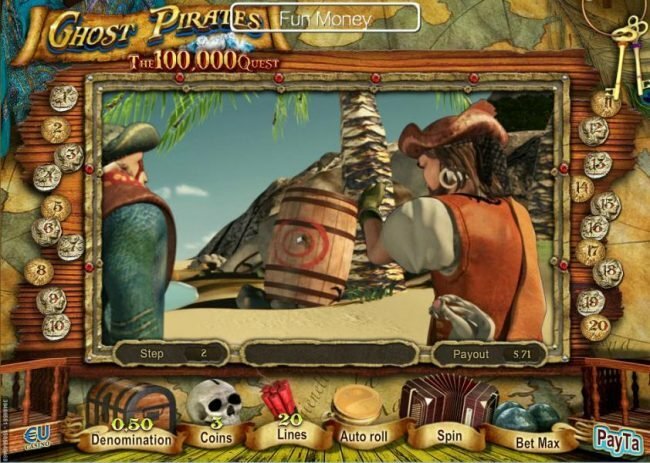 The player has to collect five symbols with the key in order to gain access to this Bonus round. 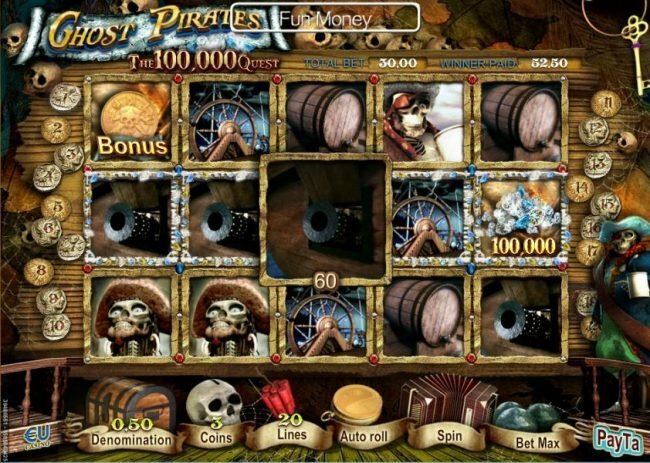 The Free Spins of Ghost Pirates are trigger with the help of at least three scatter symbols which have the pirate with the beautiful woman on them. A wild symbol is also present here and it uses the image of someone playing the accordion. It can appear on the 3rd reel and it turns the entire reel wild. 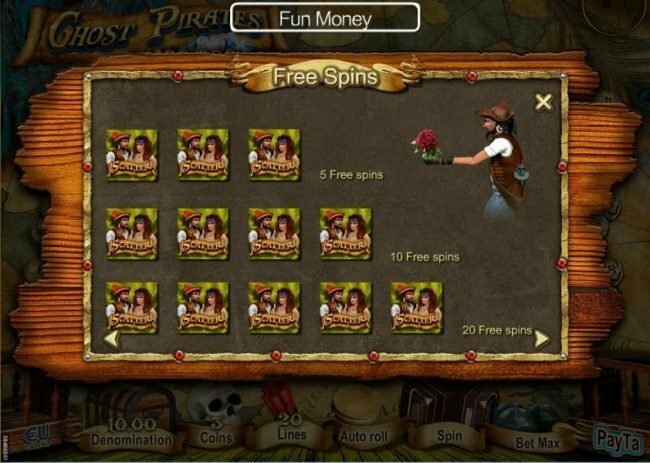 This is one of SkillOnNet’s 3D Slots and one that increases the interactive feelings of game play.